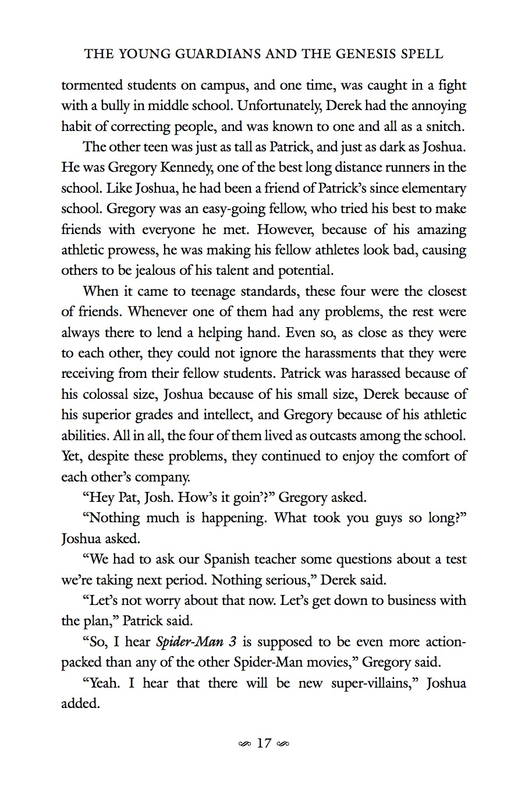 Here is a sample from the second chapter of the first volume of my series, The Young Guardians and the Genesis Spell. Enjoy! While I mainly get my inspirations for my writing through daydreams, there are some cases in which I gain inspiration from actual dreams that I remember after waking up. One of the most vivid dreams I remember is being able to fly. In those dreams, it felt as though I could float over my neighborhood by will alone with as much ease as a balloon drifting into the stratosphere. As I delved deeper and deeper into that dream, I could see all of my neighbors watching me glide over them and I was given a chance to embrace a sense of freedom I never would had when I am awake. After reliving the same dream multiple times, I was able to gather the inspiration I needed to illustrate the abilities of flight for three of my main characters. Two of them, Joshua and Cynthia, are able to fly with the use of wings while Gregory flies through the use of telekinesis. While the methods of flight vary, the overall concept is the same. Flight has been depicted in many forms of fiction and is widely considered the most prominent and popular superhuman ability ever imagined. With that in mind, I decided that a few of my characters should possess this ability. I saw the first trailer for the new Star Wars film that comes out next year and I am pleasantly surprised with how it looks so far. Because Disney rebooted the entire Expanded Universe, we do not know what to expect, but because I am such a devout Star Wars fan my mind is overflowing with different theories about what might happen. For example, I have a few theories about this mysterious new villain. Because Disney rebooted the entire Expanded Universe, we do not know whether or not the Sith truly died with Vader and the Emperor. I believe like The Force Unleashed, either Vader or the Emperor could have had a secret apprentice that survived the Battle of Endor. I heard rumors that the Inquisitor from Rebels may have some connection to this villain, so maybe he was trained by the Inquisitor. Another theory revolves around Darth Maul, whose ultimate fate remains a mystery as a result of the Son of Dathomir comics. Sure, Sidious killed Maul’s apprentice and destroyed his power base, but over fifty years have passed since then so that would be plenty of time for Darth Maul to train a new apprentice and rebuild his power base. This one of many theories I have in mind and I am looking forward to hearing more information about this film. There is a young college man who has written 2 books and is now on the 3rd book. A trilogy and maybe the start of a series? At first I thought only adventure stories as I began to read, but it has a depth of problems faced and overcome. It is not just the fight of good and evil. It deals with problems that many people face. Loss of family members, finding a new primary group. Putting the past behind, to strive for a worthwhile future. And that’s only in the first book. As the main characters continue they are met with humor as well as adventure by adding in new characters. Added in are struggles with self in not being more of whatever might have been possible in the past. Learning to be a stronger person with faced limitations. What depth of hidden human understanding it is! Just in a group of teenagers binding together to fight a common evil foe. I am looking forward to reading Grady Brown’s future books. I believe these stories from a highly imaginative new writer could be the start of something for movies or TV series once they are on the market with a large following. Even though the main characters are young , these could be for several generations to enjoy. I am not a teen or young adult. As a senior citizen I am looking forward to older people ( except for the evil ones) to be introduced. For as long as I can remember, I have always been fascinated by the concept of life on other worlds. When one thinks about how vast the universe is, it would be impossible for us to be completely and utterly alone amongst the stars. The problem is that there might be some civilizations that are so advanced that they would consider us too primitive to be of any interest. Still, I often wonder what would it take to get the attention of other civilizations out there. What does our planet have that would interest them? I plan on including alien life in my future works, including the fourth volume and one of my planned spin-offs because something will happen that will give aliens something of interest. I can imagine that the aftermath of the upcoming third volume would be sufficient enough to grab the attention of interstellar civilizations, but I will not go into the details until the fourth volume is released three years from now. Among the aliens that will appear in the future are an extraterrestrial superhero team who was affected on a personal level by the events that transpire in volume three. I will keep you all updated on further developments.